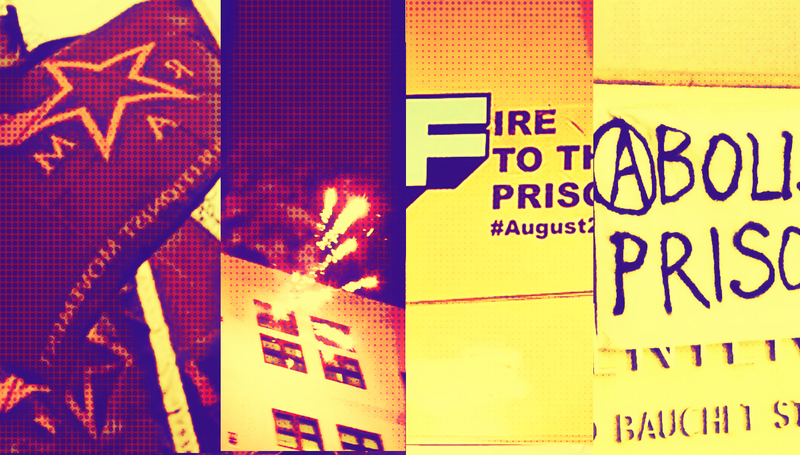 Across the US, solidarity actions took place to mark the kick off of the August 21st national prison strike. 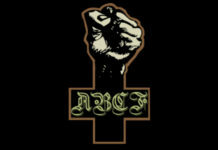 In Brooklyn, anarchists, abolitionists, wobblies, and members of the Revolutionary Abolitionist Movement (RAM) rallied and then took to the streets, leading to several arrests by police. Two rallies were held in the Los Angeles area, one outside of a women’s facility, and another a men’s prison. In Minneapolis, people wrote graffiti and set off fireworks, while in other cities, people dropped banners, painted slogans, and changed messaging on billboards to call attention to the strike. 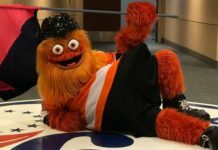 Other cities led protests against companies profiting off of prison slavery labor; in Seattle people disrupted a Starbucks, while in Des Moines, Iowa, people protested and disrupted a show room which sells prison made goods. For more upcoming prison strike actions in solidarity, go here, and for a diary of action on both sides of the prison walls, go here. 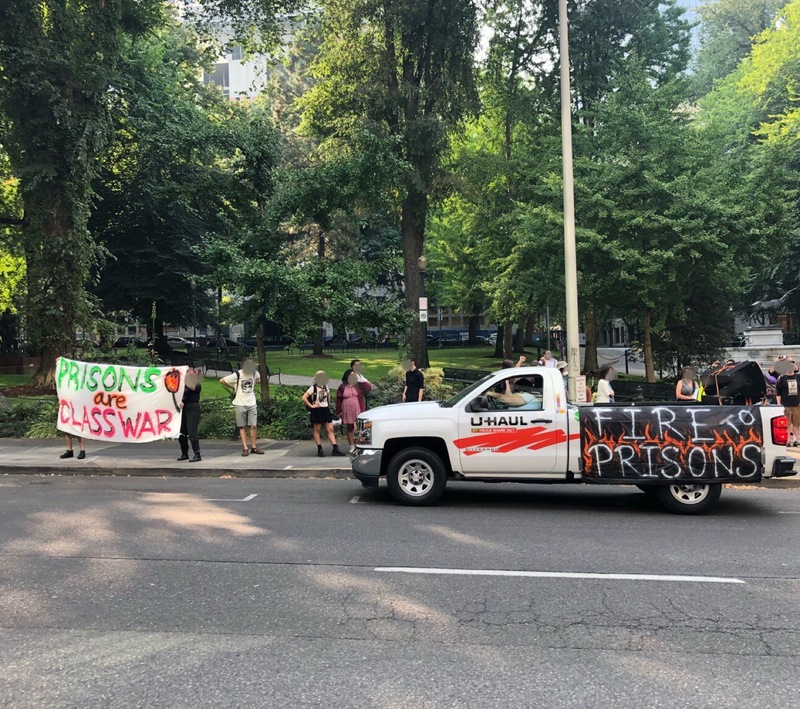 Comrades locked in the Multnomah jail in Portland, OR heard us make some noise for them yesterday. They must know that there are people out here waiting for them. !Solí a toda la gente en las jaulas! FREE ALL POLITICAL PRISONERS, FREE ‘EM ALL! Solidarity rally is held outside of the Northwest Detention Center, where it is announced that 200 detainees inside will join the national prison strike. 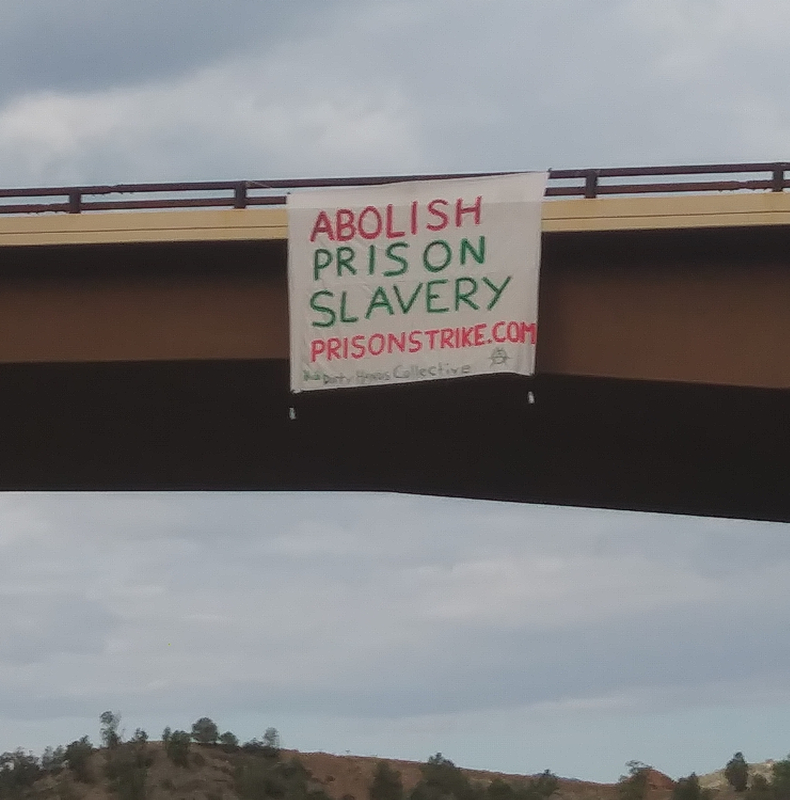 The Dirty Hands Collective dropped a banner in solidarity with the #PrisonStrike rebels in our community of Durango, CO (occupied Ute and Diné territory). We send our love and rage to those resisting modern-day slavery inside the State’s incarceration apparatus. You are not forgotten. Last night dozens of ppl gathered for an #August21 #PrisonStrike noise demo & march around Cook County Jail & Little Village in #Chicago.